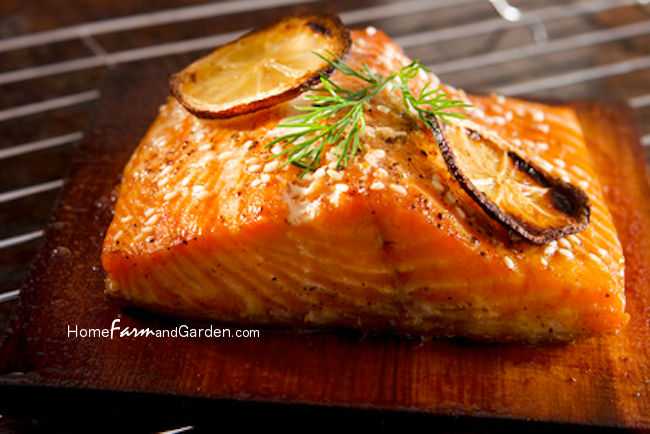 Grilling salmon on cedar planks is a great way to slow roast this tender main dish while it bastes in its own juices. The result is a delicious, yet subtle smokey flavor that is out of this world. Some of the best cedar plank salmon recipes call for a little creative thinking while preparing the planks for use. Sure, you can soak your cedar planks in plain water – but why be boring? You can add additional depth to the woodsy flavor imparted by the cedar planks by soaking them in white wine, cider or other slightly acidic liquids. Heat grill to medium-high heat and place pre-soaked cedar planks on the grill. Generously brush the salmon with olive oil and season with salt and pepper all over. Prepare the lemon-dijon sauce by whisking together the lemon zest, lemon juice, dijon mustard, dill, and mayonnaise. Evenly spread this mixture all over the salmon before placing on cedar plank, skin side down. Optional: Add thin lemon slices to the salmon filets while grilling. Cover the grill and cook for 12 – 18 minutes or until salmon is cooked through. (Cooking time will vary depending on thickness of filets and individual grill temp). Remove plank and let cool slightly before adding garnish (optional). Serve immediately.